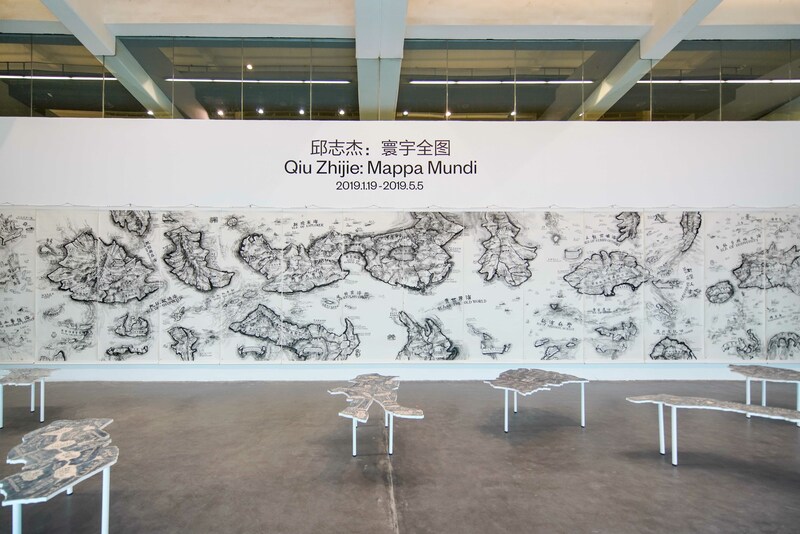 From January 19 to May 5, 2019, UCCA presents “Qiu Zhijie: Mappa Mundi,” the first exhibition after a complete architectural renovation of UCCA’s Main Hall designed by OMA, and the most comprehensive presentation of the artist’s “Mapping the World Project” to date. 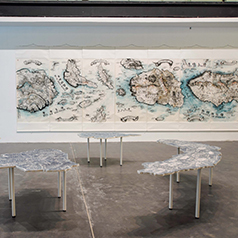 The exhibition includes 24 large-scale, ink-on-paper maps from the artist’s All of the Objects Series (2015-2017); as well as three curatorial maps that the artist devised in the last three years. 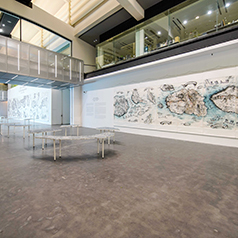 The exhibition also includes several freestanding objects, like Isms at the End of the World (2016), three video artworks depicting Qiu’s creative process, an AI software work, and, notably, Map of the Art World, a nine-by-ten-meter wall painting devised specifically for UCCA’s newly renovated atrium. 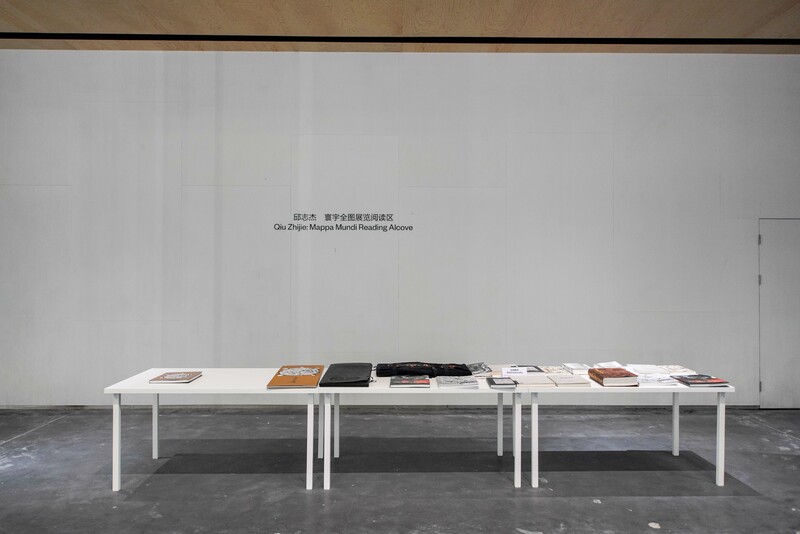 Trained as a printmaker, and an early pioneer of conceptual photography and video, Qiu is a prolific writer, curator, and educator. 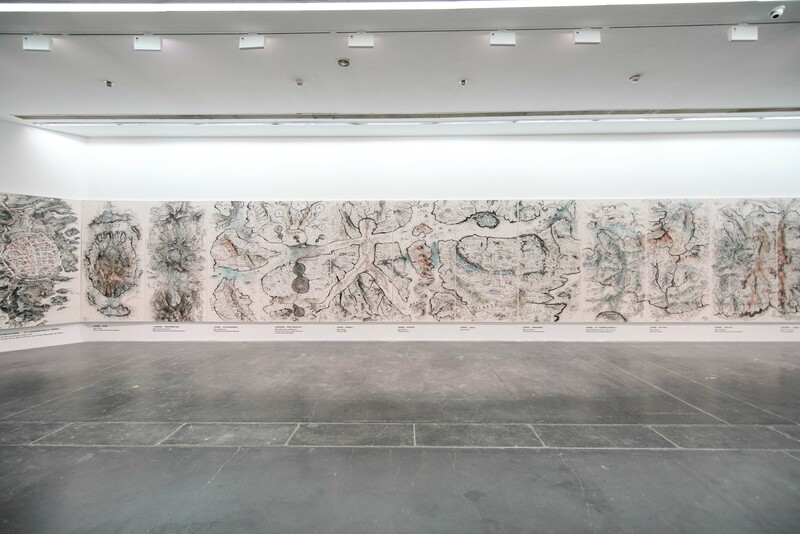 The central question of his art since the early 1990s, and his pedagogy since the mid-2000s, is how creative work can intervene in daily life, replace received ideas, demolish clichés and stereotypes, and achieve a new union between art, life, and social practice. 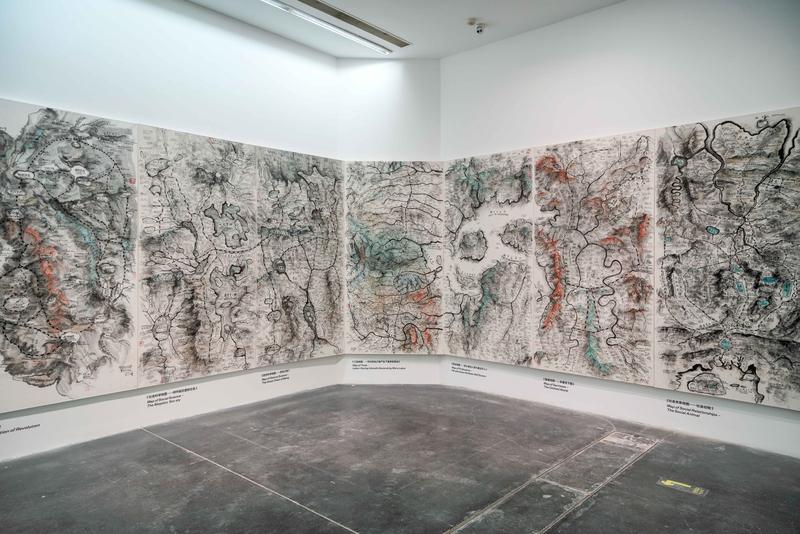 With these maps, he shows what drives his ambitious answers to this question: expansive learning, as well as his teacher’s urge to deconstruct and reassemble ideas for further consideration and discussion. 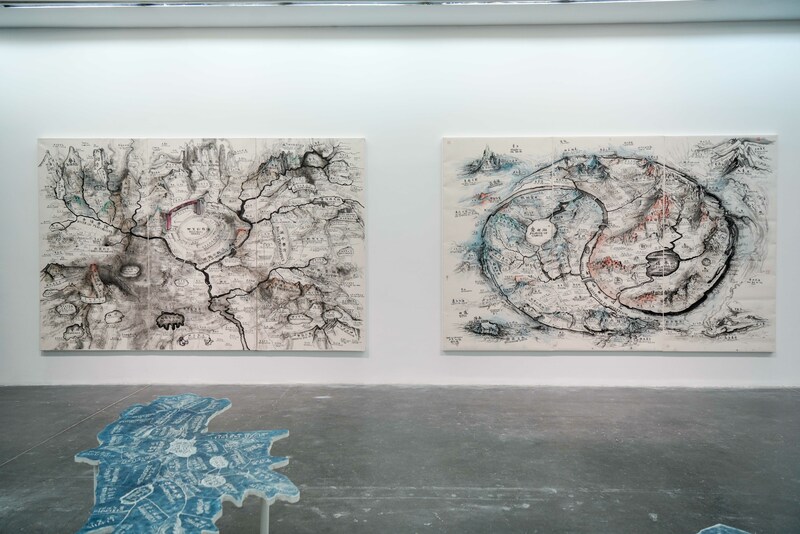 In each, he uses the pictorial conventions of cartography and landscape painting to chart geographies that encompass history and philosophy, memory and gossip. 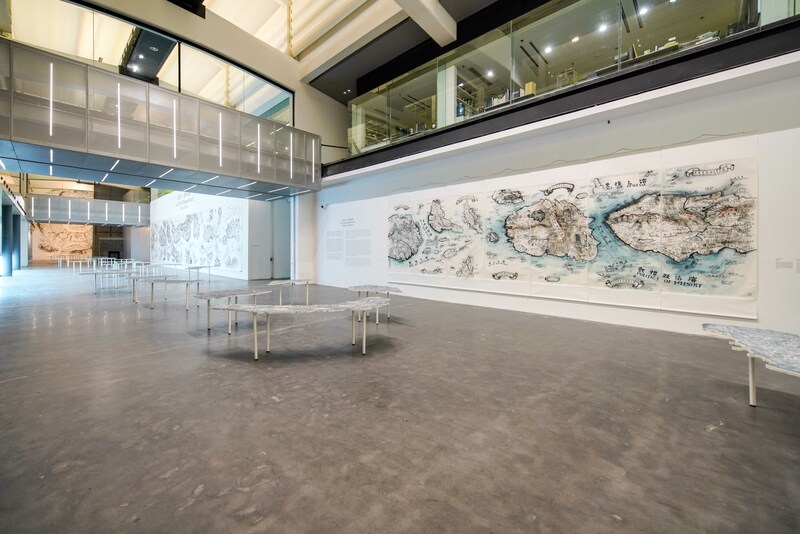 Created for the 2016 edition of the Singapore Biennale, Map of Maps depicts the artist’s research on cartographic technology. This mythopoeic take on the history of human exploration begins with the Middle Ages and encompasses the evolution of mapmaking in different countries, the Age of Discovery, Zheng He’s voyages, and other landmark moments in the history of geography. 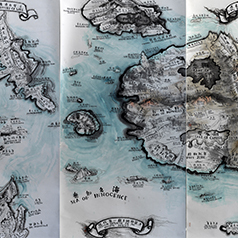 All of the Objects Series consists of 24 maps that form an inventory of worldly objects. 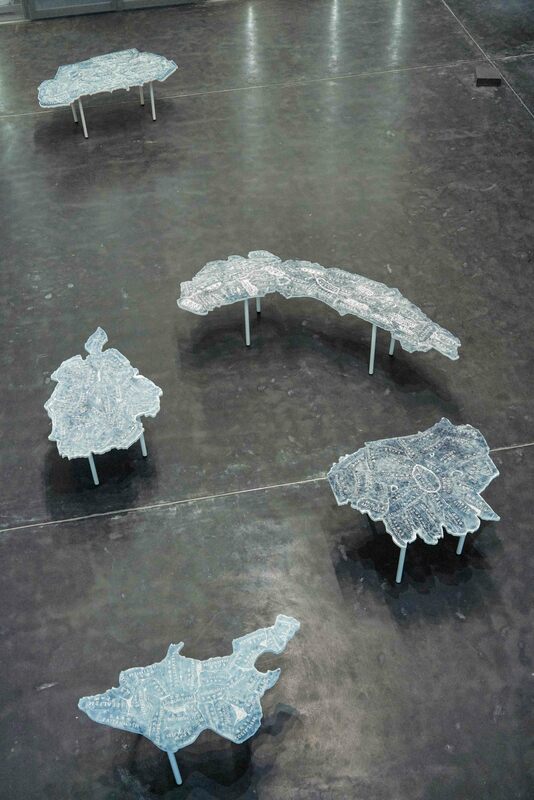 In producing this series, Qiu investigates fields as varied as sociology, politics, historiography, and anthropology. 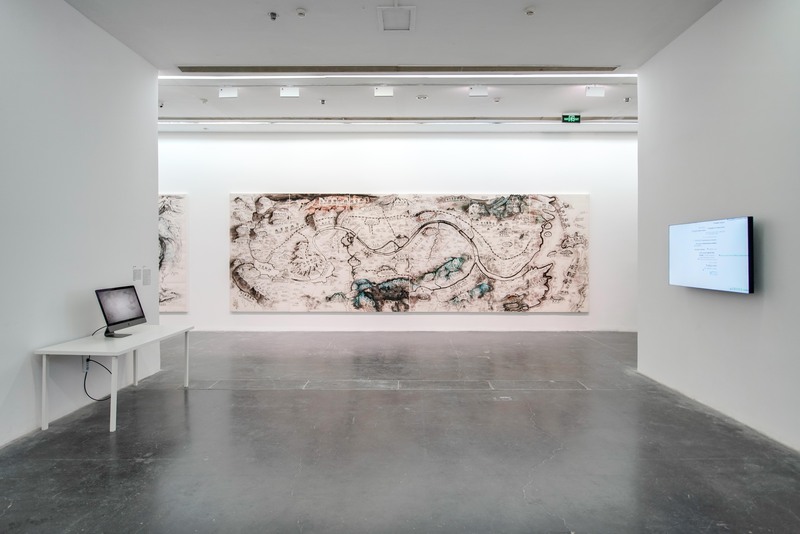 He combines different methods of organizing information, fleshing out his mind maps with traditional Chinese landscape painting, calligraphy, and information languages of the post-internet age. 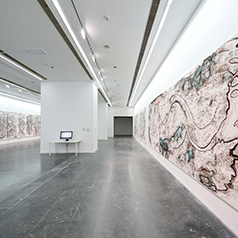 Map of Memories was first presented at UCCA’s 2017 exhibition, “Practice and Exchange: An Exhibition of Chinese Contemporary Art.” This group of artworks explores the techniques and politics of memory. 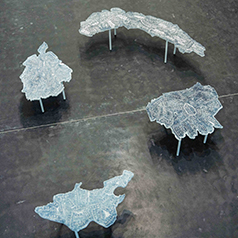 The “archipelago” on the left investigates processes and methods for producing memory, different categories of memory, and emotional states linked to memory; the “archipelago” on the right explores the relationship between individual, collective, and national memories, as well as the roles memory plays in political mobilization and historiography. 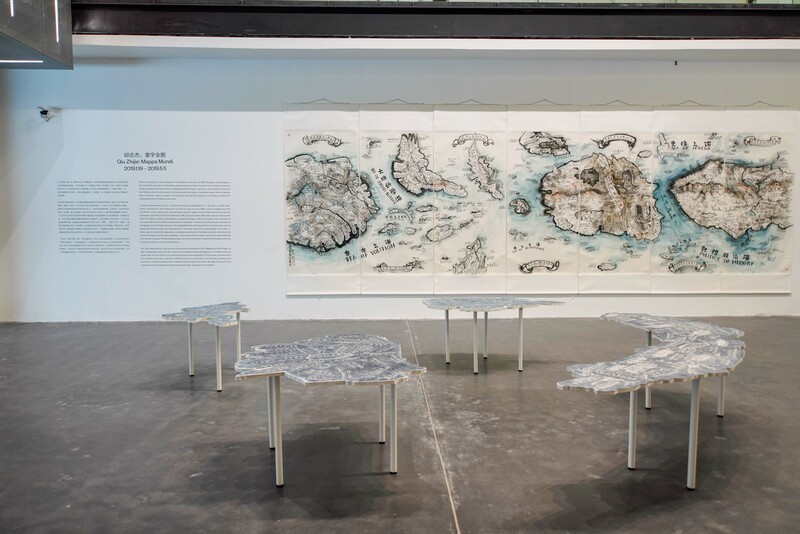 Isms at the End of the World is a series of 28 installations—each a map spread on a table—and forms another archipelago, arrayed across the exhibition space. 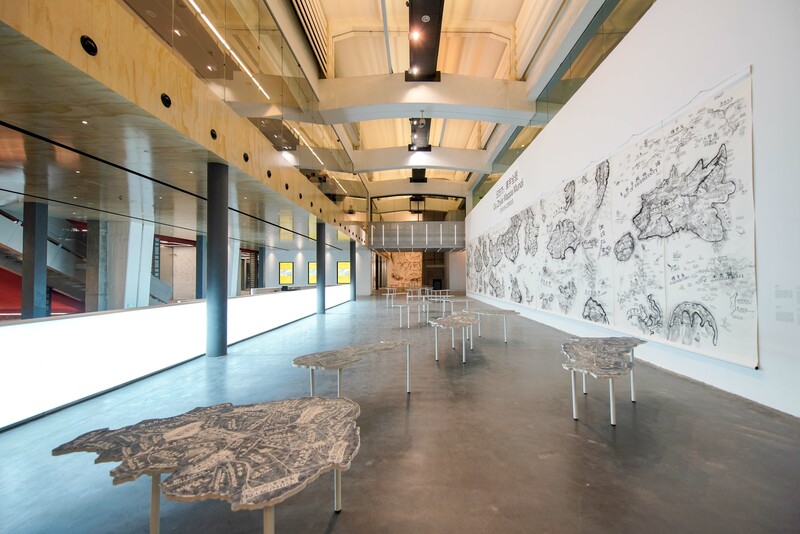 Visitors can walk among each object, as if shuttling between different schools of thought. 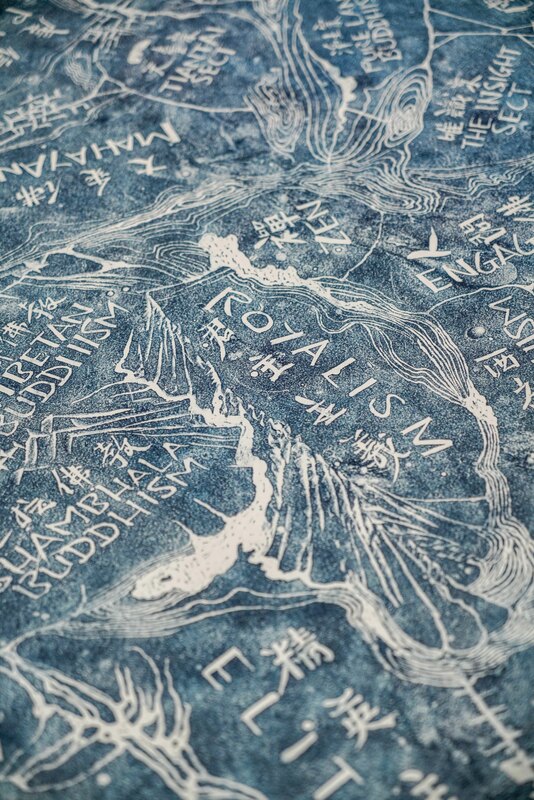 Unlike the ink-on-paper artworks, these maps employ an ancient Chinese ink rubbing technique traditionally used to copy the surfaces of steles and ceremonial vessels. 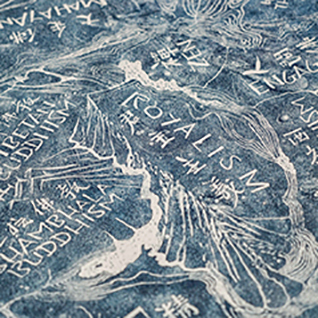 In his early years, Qiu trained in calligraphy and seal carving; for him, they serve as both artistic technique and cultural inheritance. 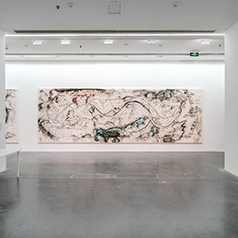 Map of the Art World, created specifically for “Mappa Mundi,” is Qiu’s latest in a series of site-specific murals, offering a concise history of China’s art world since 1989. 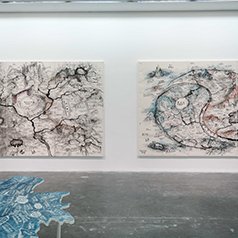 The work is suffused with the artist’s wry sense of humor and his poetic sensibility, from the naming of geographic elements to the surprising arrangements of space. 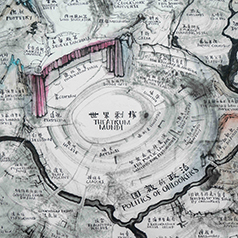 Qiu has also produced curatorial maps for various exhibitions. 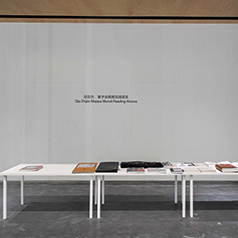 He created Why the Performance for an exhibition of the same name that he curated at the Ming Contemporary Art Museum in 2016. 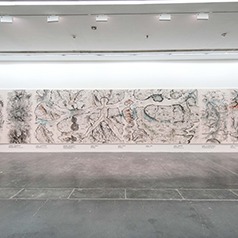 It outlines the history of performance, its various styles and theories, its political implications, and the performativity of modern social roles. 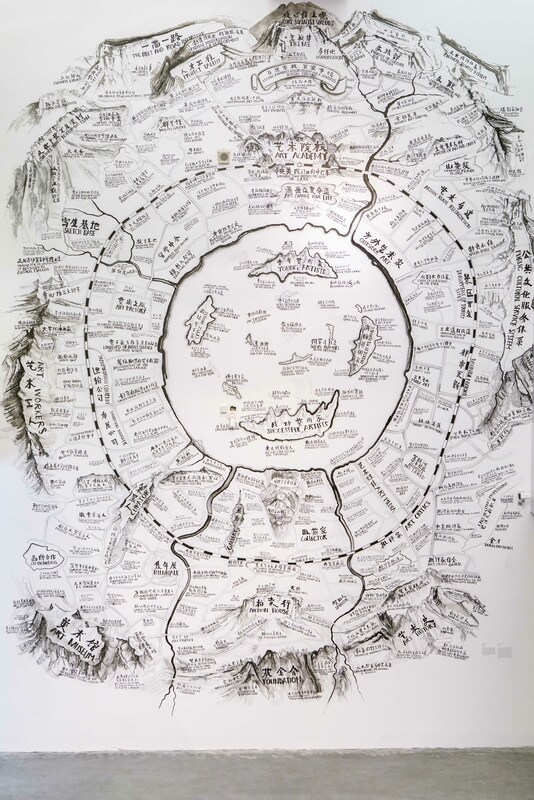 Map of Continuum, similarly, is a curatorial map prepared for the Chinese Pavilion of the Venice Biennale. 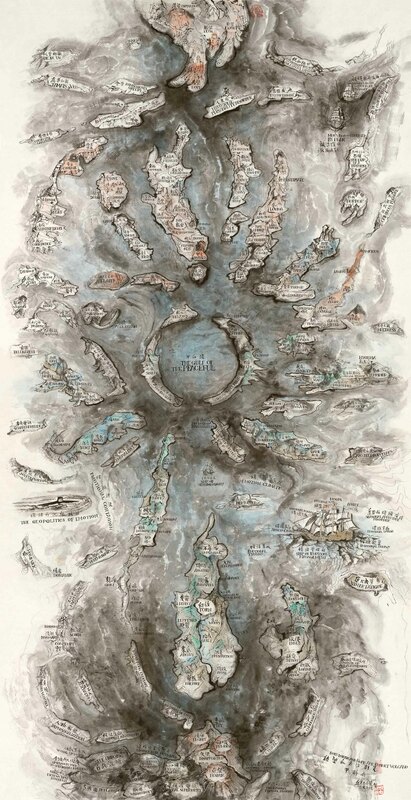 The map’s outline resembles a diagram of a taijitu, more commonly known as yin and yang in Chinese cosmology, and the spatial details are based on terrain of Venice—even the bridges are modeled on real Venetian architecture. 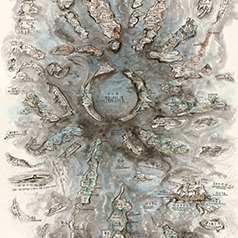 “Mappa Mundi” marks the first time the ink version of this work has ever been exhibited. 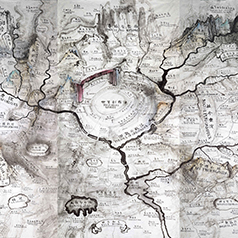 Map of “Art and China after 1989: Theater of the World” was commissioned by the Solomon R. Guggenheim Museum for the eponymous exhibition. 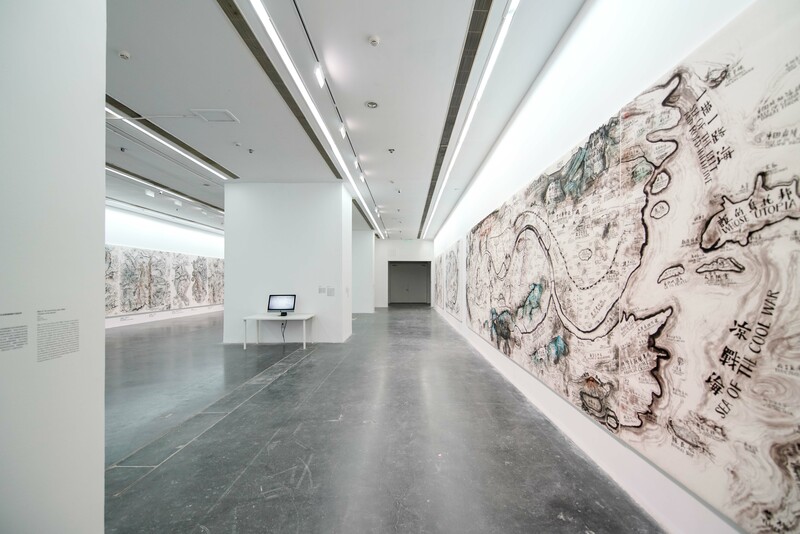 It offers an overview of the development of Chinese contemporary art. 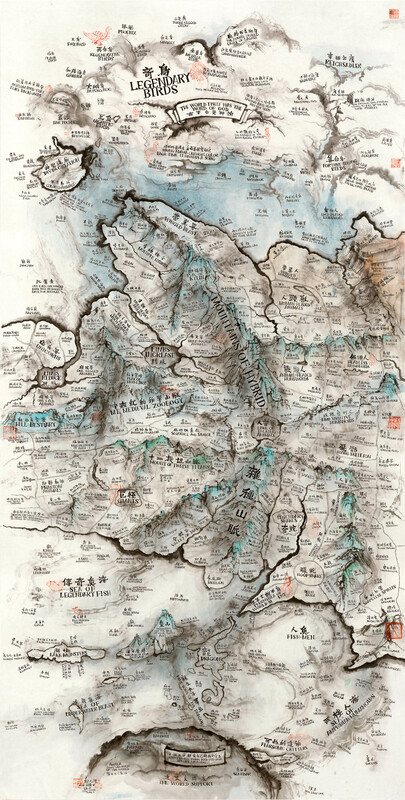 On the upper part of the map, the artist depicts a mountain range that represents changes in China’s political thought over the past forty years. 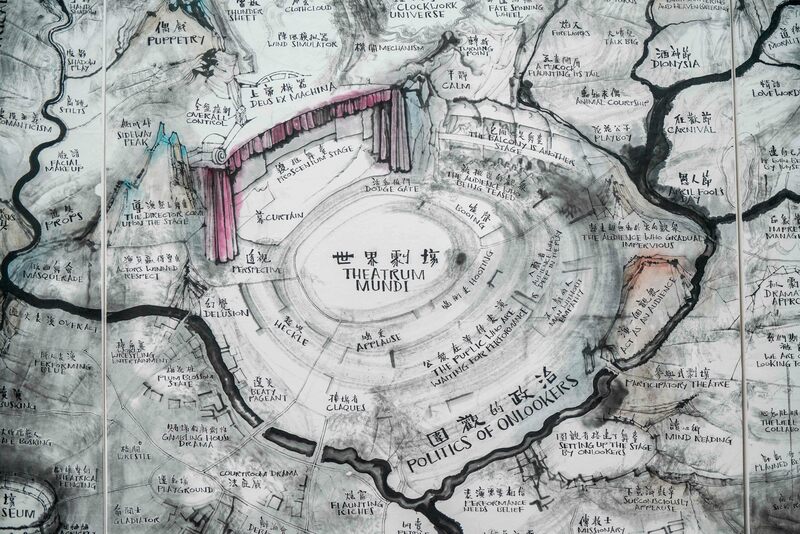 On the bottom, another mountain range traces the winding course of globalization. 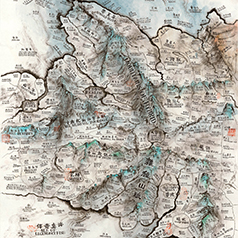 These two mountain ranges form a sociopolitical frame for the convergence of rivers at their center, which symbolizes Chinese contemporary art. 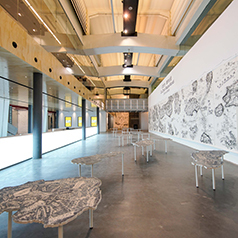 The exhibition also includes a set of films and interactive programs. 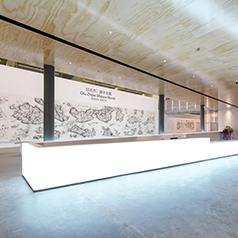 Wall Project Slideshow condenses Qiu Zhijie’s “Maps” series into a single video; Mind Map Animation portrays the creation of Qiu’s mind maps. 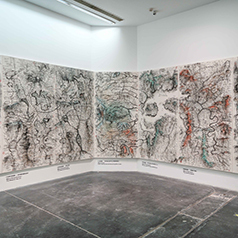 JD AI Map Generator, born in the collaboration between Qiu and JD AI Research’s He Xiaodong, is an AI program given a list containing tens of thousands of words taken both from Qiu’s artistic vocabulary and from JD’s own database; researchers have applied existing linguistic data to program the AI’s operating logic, and the artist has then used one of his own mind maps to teach the software creativity and humor. 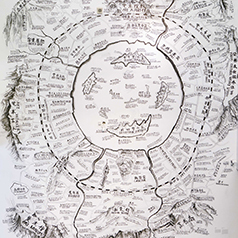 As audiences speak or input certain words, the program generates, associatively, a map in Qiu Zhijie’s style that incorporates landscape and image elements that run throughout his work. 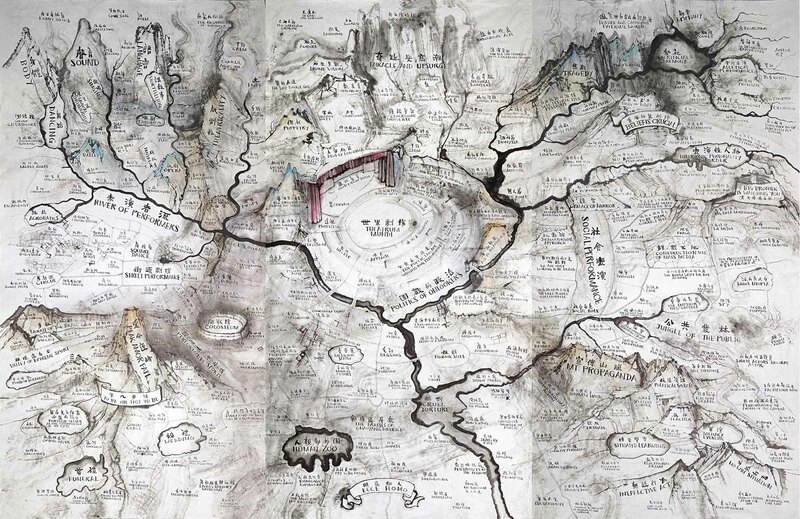 Qiu believes that map-making produces “awareness” rather than “understanding.” The narratives in these maps are rooted in life, appealing to the sensorial, exploring lost meanings and hidden connections that lie outside of history and common knowledge. 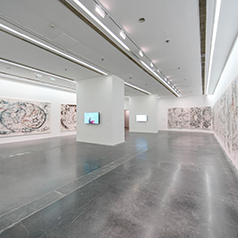 The exhibition is thus less a collection of finished work than a presentation of a constantly expanding, open experiment. 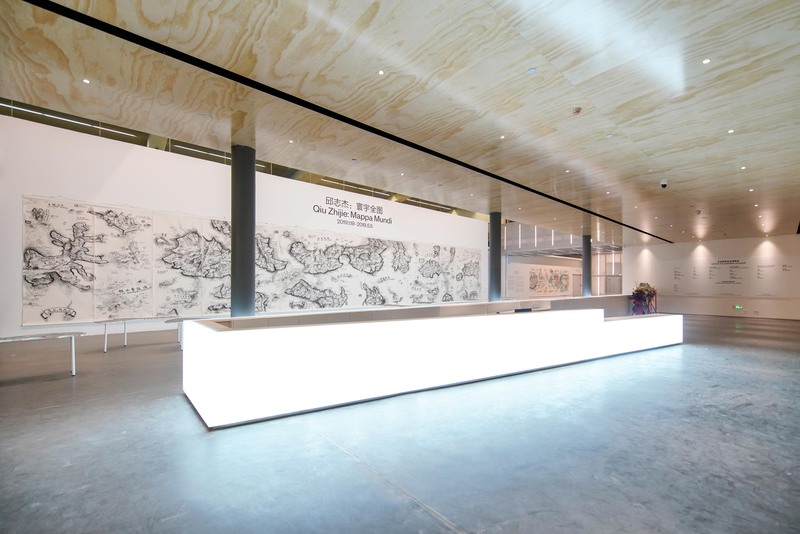 Through the diverse cultural relations found throughout this terrain, Qiu offers us a set of tools to understand our own thinking and creativity against the fraught background of the present. 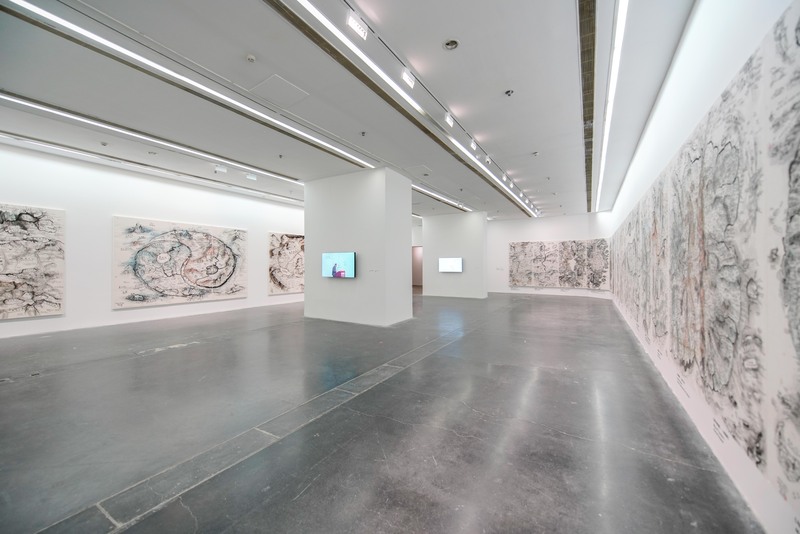 UCCA thanks its strategic partner Aranya for supporting “Qiu Zhijie: Mappa Mundi.” This exhibition includes a series of related public programs, which allow participants to respond to Qiu ZHijie’s creative practice; they are presented, performed, or curated by the dancer Hou Ying, He Xiaodong of JD AI Research, and the artist himself. 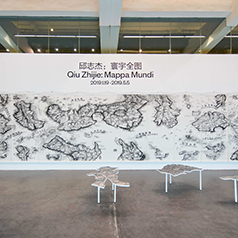 Download “Qiu Zhijie: Mappa Mundi” press release. 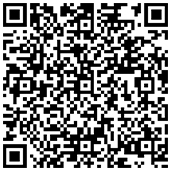 Please scan the QR code to purchase tickets. 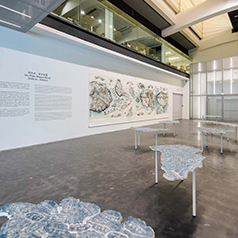 *Event tickets may not be returned or exchanged. 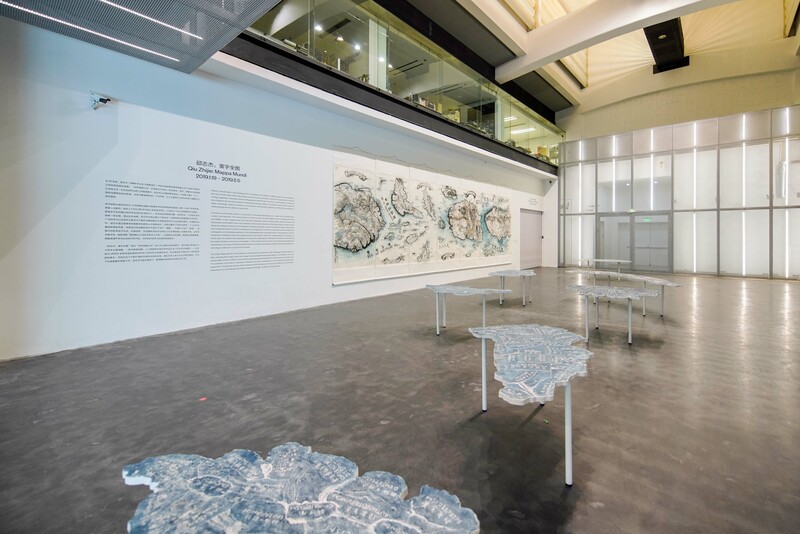 *From March 7 to 10, 2019, part of the artworks from “Qiu Zhijie: Mappa Mundi” will be covered; during this period, visitors can view the multimedia project, “Urban Spectrum,” located in the same space. Thank you for understanding.